A wildfire occurred in Fourmile Canyon near Boulder, CO in September 2010. The fire provided scientists a rare opportunity to study the geomorphic processes that occur soon after large wildfires. Researchers from the US Geological Survey and the University of Colorado in Boulder, employ a terrestrial laser scanner (TLS) to map micro-scale geomorphic features within a small watershed in the burn-zone. UNAVCO provided the TLS equipment and technical expertise to produce a high-resolution terrain map of the study area. Repeat surveys will allow researchers to investigate geomorphic changes at the study-site with sub-centimeter accuracies. TLS data like these are illuminating new understanding of earth surface processes in our backyard and around the Globe. This study site is within the Boulder Creek Critical Zone Observatory (BcCZO), one of several CZO's funded by NSF. This ongoing project is funded by the National Science Foundation, the USGS and CU. 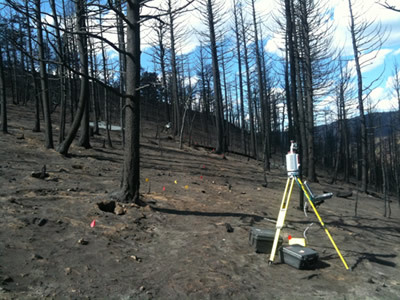 Figure 1 - A Riegl VZ400 laser scanner collecting data at the Fourmile Canyon study site soon after the wildfire of September 2010. Photo by Brendan Hodge (UNAVCO). 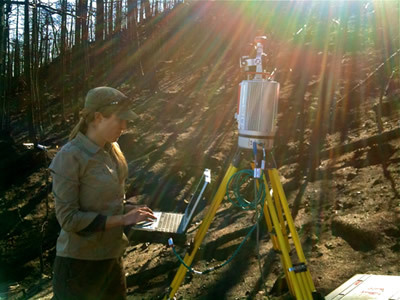 Figure 2 - UNAVCO engineer Sarah Doelger operating the Riegl VZ400 laser scanner at one of many scan locations within the study site. Photo by Brendan Hodge (UNAVCO).